I am enquiring into the mitosciences Sucrose gradient separation protocol. I am keep to perform this and attempt to confirm my protein is mitochondrial, however have only got access to fixed angle rotor for the ultracentrifuge that runs that this speed (100,000g). Can this protocol be adapted? Or otherwise can the fast centrifugation step be carried out at a slower speed and yield similar results? Also do you need to start with a heavy mitochondrial fraction? i.e one already gone through say a percoll gradient? MitoSciences Sucrose gradient (ab110414) protocol is a protein subfractionation method optimized for mitochondria. Therefore, the starting material is enriched mitochondria. To fractionation mitochondrial proteins, sample material needs to go through the sucrose gradient. The force generated by fixed angle rotor is on the side wall of a centrifuge tube but not go through the central of the tube. Therefore, the fixed angle rotor could not fulfilled the request. With this formula, you can figure out if you can use a low speed centrifuge by doing the math. Envío adjunto un power point con la imagen de un western realizado con el kit MitoProfile® Membrane Integrity WB Antibody Cocktail en extractos mitocondriales de corazón humano. Como describe el folleto del kit aparecen 5 bandas principales frente a proteínas mitocondriales. Nuestra duda es que a la altura a la que aparecen las bandas no se corresponden los pesos moleculares esperados que calculamos a partir de los marcadores de peso molecular (la altura predicha se ve en bandas verdes marcadas). ¿Podrían ser igualmente las bandas que se observan las de las proteínas a las que está destinado el kit aun quedando a una altura distinta a los pesos molecularesesperados (mas baja)? Atendiendo a la imagen enviada, las bandas parecen corresponder con las esperadas correspondientes a las distintas estructuras mitocondriales. Es muy posible que la banda más intensa que sale entre 50-60 KDa pertenezca al doblete de bandas superior que figura en la imagen de la datasheet. Para poder visualizarlo, y obtener un blot más claro, yo sugeriría aumentar el porcentaje del gel. Desconozco el que se ha utilizado, pero quizás un gel al 15% ayudaría a visualizar mejor las bandas. Confío en que estas sugerencias sean de utilidad. No dudes en contactarnos de nuevo para más información. 1. Does the MitoProfile; Membrane Integrity WB Antibody Cocktail (ab110414) work for whole cell extracts? 2. Do the antibodies come in a tube or separate tubes? 1. The MitoProfile® Membrane Integrity WB Antibody Cocktail (ab110414) should be suitable for whole cell extracts. You may observe some background staining as the product has been optimized on Mitochondrial extracts, and it may be necessary to optimize the sample preparation, dilutions, and detection conditions. However I see no reason why it should not be functional. 2. The antibodies are provided as a cocktail in a single tube. ich hoffe, ich habe Ihren Namen richtig verstanden. Wie gestern telefonisch besprochen, finden Sie unten eine Zusammenfassung unseres Projektes mit der Bitte um Weiterleitung an die Spezialisten bei MitoSciences. Über eine möglichst rascher Rückmeldung würde ich mich sehr freuen, damit wir weiter planen können. We are planning to conduct a biomarker discovery study including 6000 individuals who have been recruited for a much larger epidemiological project 20 years ago. Study participants were in their fifties at baseline and have been regularly contacted since to secure their continued participation. We intend to include 3000 still cognitively healthy controls and compare them with 3000 individuals who have developed Alzheimer’s disease dementia in the meantime. The main goal of our study is to relate biomarker results from 20 years ago to the participants’ cognitive status now. As part of the biomarker discovery we are considering the inclusion of mitochondrial function markers. Could you please answer the following questions so that we can decide how to proceed? - Buffy coat samples to extract PBMC are available that have been stored at -196°C since the blood draw 20 years age. Are these samples appropriate for your assays? - Do you have any idea which markers would make sense in the context of Alzheimer’s disease (e.g. OXPHOS complexes)? - Which technique would you suggest to use for a large-scale study? We are working on a tight budget. Vielen Dank für die Zusammenfassung in Englisch. Ich habe nun eine Antwort von unseren Mitochondrien -Spezialisten aus dem Labor erhalten. Buffy coat samples to extract PBMC are available that have been stored at -196°C since the blood draw 20 years age. Are these samples appropriate for your assays? It depends on the buffer in which they have been stored. I’m assuming from the temperature specification that the samples have been frozen in the vapor phase of liquid nitrogen. If they were frozen in freezing media containing 30 – 50% FBS + 10% DMSO + Standard Culture media, then they will be viable and in good condition to determine protein based end point biomarkers. If this is not the case, it will be difficult to get good proteomic data out of the samples because the freeze/thaw process may break the granulocytes and release proteases that will completely degrade the samples before you have a chance to work with them. These proteases are extremely potent and are difficult to inhibit with regular protease inhibitors available in the market. Do you have any idea which markers would make sense in the context of Alzheimer’s disease (e.g. OXPHOS complexes)? We have a fair amount of experience with Mitochondria, however our experience with the use of PBCSs as surrogate markers of disease states is more limited. We only have experience of this in the field of HIV and retroviral therapy, where OXPHOS proteins (CI and CIV) have been shown to be potential good surrogate markers of therapy toxicity in this subgroup of patients. Do you want to use PBMCs as a surrogate tissue for the discovery or for the validation of biomarkers of brain injury (Alzheimer’s Disease)?. If you are planning a DISCOVERY type of experiment, my suggestion is to look more broadly in the mitochondria proteome and even in the whole cellular proteome. Antibodies and Immunoassays are not very suited for this type of discovery research. There is a paper in the literature where they used a combined methodology (genomic/transcriptomic/proteomic profiling) to discover Alzheimer’s disease markers in the blood. This was published by a group at the University of Louisville Email: mailto:eugenia.wang@louisville.edu. My suggestion is to email the senior author to discuss their results and potentially collaborate with them to select true candidate targets for validation. Antibodies and Immunoassays are particularly useful in the validation stage, where you have selected a number of targets in the discovery phase and want to validate the results (remember that discovery phases have a large number of false positives even when this is controlled statistically with the use of “false discovery rate”). If you find in your talks with Professor Wang that the OXPHOS complexes or other mitochondria targets are in the list of candidate biomarkers, then the questions is how to use the best product/platform that measures that target, which is your next question. The answer to this question depends first on your accessibility to instrumentation. Do you have access to plate readers, are they colorimetric or fluorescent?. Do you have access to a flow cytometer? How many people will perform these experiments (data on 6000 samples with the use of immunoassays is not trivial), are they located in a single centralized large lab or in multiple labs around the world? We have a platform called “Dipsticks” or lateral flow immunoassay which have been used by previous researchers in the past with PBMCs on other types of diseases. I can provide references with the use of Dipsticks in PBMCs in mitochondrial disease, frataxin, HIV/antiretroviral therapy and traumatic brain injury (which used PDH as a marker). These studies were a lot smaller than yours though. The main disadvantage of Dipsticks is that they are not amenable for high throughput. However researchers have used them in these studies, because they are extremely easy to use and require minimal training, for quantitative data they require a specialized reader “dipstick reader” which costs a fraction of what a regular microplate reader costs and could be easier to use in the future as potential “point of care research tests”. Bear in mind that all our products are RUO (research use only). Dipsticks are inexpensive but do require a large amount of “man power” and many of them have a higher sensitivity than the microplate counterpart. Our dipsticks measure the target proteins either in a sandwich ELISA or with an activity assay. Your other option could be microplates, which will allow you to run 96 tests at a time. I discourage you from using western blot in so many samples. Western blot is not quantitative when it comes to comparing results from one blot to the next, whereas the microplates or dipsticks are easier to compare from run to run. I encourage you to visit our metabolism page and look at different targets in these two platforms. On the main page there is a video about the dipsticks which will allow you to learn more about them. Once you decide on a particular target/platform we will happily help you with further scientific support. Ich hoffe diese Information ist hilfreich und wünsche Ihnen viel Erfolg mit Ihrer Studie. We need to know if in performing in w. blot this antibody cocktail the protocol is the same as per one single antibody. Yes, you use a cocktail antibody in the same way as a regular antibody in WB. 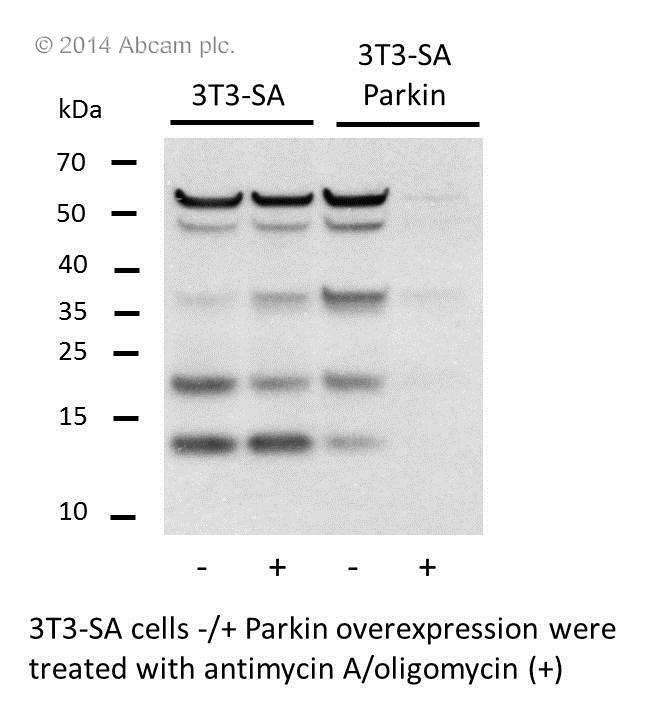 You'll need an anti-mouse IgGHRP conjugated antibody. You can load 10ug of the rat liver mitochondria as a control. How much is recommended to use of the positive control per gel/experiment? Thank you for your inquiry. I am happy to confirm the amounts of positive control per gel: Please use 10ug of the rat liver prep each lane or any positive control that is given. I hope this information is helpful and wish you a good start into the new year. Thank you very much for your reply, I forwarded the mail to the customer. She now explains her project and wants me to ask you if you have any ideas, or products which she might be able to use. Here is her mail: Thanks so much for finding out from the company for me. I have rodent mitochondria samples that I would like to use, and preferably I would like to test all 4 or 5 of the electron transport chain complexes - that is why I mentioned the 5x96-well plate assay as it seemed to me that this could test all 5 complexes. The reason I am interested in this product is to find an alternative to the Oxygraph method that measures oxygen consumption and electron transport chain complex functioning. I am however at the stage where I do not know whether all 5 of the complexes' activity will be altered with my intervention (an antiretroviral drug). I have looked through the database and discussed this with my promotor, and we suspect that as a first step we could try the MitoProfile Membrane Integrity Cocktail antibody as well as the ATPase/Complex V specific activity to get an idea of what is happening. I have previously ordered the MitoOxphos Complex I-V Cocktail (and will order it again soon - I require more), and I believe that this might give us better leverage as how to go forward with our hypothesis. My hypothesis is that one of the antiretroviral agents used in HIV/AIDS treatment can induce mitochondrial abnormalities, and studies have shown various effects ranging from changes to mitochondrial DNA, mitochondrial gene expression and membrane integrity. However my study is quite novel and we are unsure whether our experimental conditions would confirm previous findings, and if the drug could alter not only gene and protein expression levels of the complexes, but affect functioning with ATP production and structural integrity. You are welcome to pass this information on to your contact at Abcam - perhaps with this info they can advise more appropriately. I do however think that the ATPase specific activity assay might be a very good choice to later substantiate Oxygraph analyses. Thank you for your reply. I have been in touch with our colleagues at Mitosciences who have kindly provided the following information: To answer your question directly, The antibody coating the plate supplied with Kit MTOX1 ab109903 does not cross-react with rat samples (it is human/bovine only). If you would like to test complex I activity in Rat mitochondria, it would be better to purchase kit ab109121. Click here (or use the following: https://www.abcam.com/index.html?datasheet=109121). However, the drawback of kit ab109121 is that it is not rotenone sensitive as it is only the dehydrogenase activity of the enzyme and does not follow the complete reaction (dehydrogenase-ubiquinol reductase). This is explained in detail in the protocol on the datasheet. To answer the complete question, we have had a substantial experience testing mitochondrial toxicity due to antiretrovirals. It looks to me that you are treating animals with an antiretroviral compound for HIV? The effect on mitochondria due to antiretroviral therapy varies tremendously depending on the regime used and to my knowledge the most prominent causes of mito toxicity are : (1) inhibition of chain elongation and/or exonuclease activity of the mtDNA polymerase γ, (2) inhibition of thymidine kinases, (3) oxidative stress, (4) impairment of the adenine nucleotide translocase and (5) reduction in mitochondrial membrane potential (Δψm). The easiest and most economical way of looking at such a wide spread of potential effects in mitochondria is by testing cultured cells exposed to the compound with the following sets of kits: ab113849 ATP luminescent detection kit = check the scientific support tab as well as the protocol for further insight into mitochondrial toxicity testing. This can test the mitochondrial bioenergetic state of the cell by comparing treatment in glucose vs. galactose based media. Click here (or use the following: https://www.abcam.com/index.html?datasheet=113849). ab113850 JC1 or ab113852 TMRE. Both of these test membrane potential. The protocol also has insights as to the effect of low membrane potential in the overall mitochondrial metabolism. Click here (or use the following: https://www.abcam.com/index.html?datasheet=113850). Click here (or use the following: https://www.abcam.com/index.html?datasheet=113852). ab113851 DCFDA = which measures ROS. Click here (or use the following: https://www.abcam.com/index.html?datasheet=113851). ab110217 and ab110216 Mitobiogenesis In-cell ELISA kits (colorimetric or IR) = These will measure the effect of a compound on the protein levels of a mitochondrial DNA encoded protein (typically affected by nucleoside reverse transcriptase inhibitors) in comparison to the protein levels of a nuclear DNA encoded protein (not affected by NRTIs). Click here (or use the following: https://www.abcam.com/index.html?datasheet=110217). Click here (or use the following: https://www.abcam.com/index.html?datasheet=110216). The kits above mention can be used with any mammalian cell. The mitobiogenesis kits can be used with human, rat, mouse or bovine cells. The protocols explain in detail how to set the experiments. If you haven’t tested the compound with the first basic acute tests on cells, I would recommend to do this. It will help to narrow down the potential cause of toxicity or at least help have a viable hypothesis of what could be happening in the animal. If the first four are normal (after acute treatment) I would suggest for to move ahead with the mitobiogenesis kit after treating the cells for at least 5 – 7 passages. If they have a very good reason to suspect (due to the chemical structure of the compound) that the effect will be only on the mtDNA polymerase, then my suggestion is to go directly to the ab110217 to confirm the hypothesis. Once you have a reasonable hypothesis of the effect of the compound in-vitro, then choosing the test for in-vivo testing will be much easier. i.e if the retroviral has an important effect on ROS production then they may want to follow up with antibodies that target ROS induced post-translational effects such as anti-nitrotyrosine, ab110282. Click here (or use the following: https://www.abcam.com/index.html?datasheet=110282). If galactose sensitizes the cells to compound toxicity as measured by the ATP luminescent assay, then very likely the compound is affecting the enzyme activity/assembly/levels of one of the complexes of the electron transport chain. In this instance, then they will need to determine if it is a direct or indirect effect on the enzymes. The MTOXC kits (5 kits) will test whether the compound affects directly any of the enzymes using bovine mitochondria (Note that if a compound directly inhibits the transfer of electrons, by in-vitro testing, in bovine mitochondria, it will very likely affect the transfer in of electrons in other mammalian species such as rat). MTOXC will test activity in the presence of compound (while the assay runs) The following MS kits: Complex I Enzyme Activity Microplate Assay Kit ab109721, Complex II Enzyme Activity Microplate Assay Kit ab109908, Complex IV Rodent Enzyme Activity Microplate Assay Kit ab109911 and ATP synthase Enzyme Activity Microplate Assay Kit ab109714, all of which are rat reactive) will test indirect effect of the compound in the activity of enzymes (post-translational modifications, assembly defects) in tissues of treated animals. ab109721 Click here (or use the following: https://www.abcam.com/index.html?datasheet=109721). ab109908 Click here (or use the following: https://www.abcam.com/index.html?datasheet=109908). ab109911 Click here (or use the following: https://www.abcam.com/index.html?datasheet=109911). ab109714 Click here (or use the following: https://www.abcam.com/index.html?datasheet=109714). These MS kits test activity of tissues or cell extracts after they have been exposed to an experimental condition. For example if you test NRTI compounds with MTOXC, all results will be normal. However if you test with the MS kits tissues from animals treated with NRTIs for a prolonged period of time, you will see decrease in activity. You could use the following antibody cocktails: ab110413 MitoProfile® Total OXPHOS Rodent WB Antibody Cocktail Click here (or use the following: https://www.abcam.com/index.html?datasheet=110413). ab110414 MitoProfile® Membrane Integrity WB Antibody Cocktail Click here (or use the following: https://www.abcam.com/index.html?datasheet=110414). If you believe that the structural membrane integrity of the mitochondria (of treated animals) can have an important impact in complexes assembly and protein levels in specific compartments, then these cocktails may be a good choice. Note that the ATP synthase Enzyme Activity kit ab109714 measures the reverse reactions (ATP hydrolysis) and not ATP synthesis, however the ATP hydrolysis is still oligomycin sensitive. A decrease in oxygen consumption by the oxygraph could be due to effects in any of the complexes and not just ATPase. I.e. rotenone affects oxygraph results, but it is a complex I specific inhibitor. So choosing this early one MS541 kit may lead them into a wild goose chase. You would need to look at mitochondria in a more holistic way and not just as a measure of ATP synthesis. I hope this information will be helpful to you. if you have any further questions, please do not hesitate to contact us. Thank you for contacting us with your questions about ab110414. The antibodies will be provided in one tube, at a total concentration of 2.37 mg/mL. The individual amounts of each antibody are available on the datasheet. We recommend using the cocktail at 10.2 ug/mL (~1:230 dilution), and since you will need at least 5 mL of antibody solution per blot, one vial will probably provide around 5 blots of antibody (10 ug/mL x 5 mL= 50 ug/blot). You can use any kind of standard detection method with this cocktail, including chemiluminescence, depending on what kind of secondary antibody you plan to use with the cocktail. I hope this information is useful, but please let me know if you have any further questions and I'll be happy to help.